The LBA Woods is more than an L-shaped green place on a map. It is the last largest undeveloped parcel in the City of Olympia. It is a dense forest, an urban oasis, a refuge for wildlife, and a treasured natural area for our community. A Functioning Forest: The LBA Woods is 150 acres of upland forest dominated by native trees, shrubs, and flowering plants that are critical to a healthy environment, wildlife habitat, and livable city. Though the LBA Woods has been logged in the past, the mature Douglas-firs and Big-Leaf Maple trees and younger trees provide us with clean, cool, breathable air. The dense canopy of leaves and branches intercepts rainfall to reduce soil erosion, storm-water runoff, and flooding of nearby roads and playing fields. The canopy also reduces the urban heat island effect, reduces heating/cooling costs, lowers air temperatures, and reduces air pollution. Understory plants provide a wealth of environmental benefits—from reducing soil erosion, increasing biodiversity, providing food and shelter for wildlife, and attracting pollinating insects, which are vital to our local food supply. Read Trees and Plants of the LBA Woods by local forestry scientist Ted Thomas. The dense woodlands, wetlands, and open meadow in LBA Woods are home to surprisingly diverse population of large and small mammals such as coyote, deer, porcupine, mountain beaver, possum, raccoon, voles, and skunk as well as amphibians, insects, and birds. LBA Woods provides important habitat to at least 55 bird species—from diminutive Ana’s Hummingbirds and Pacific Wrens to large Barred Owls and Pileated Woodpeckers. These and other birds use the LBA Woods for nesting, for shelter during migratory flights, and for foods provided by the abundant berry- and nut-bearing plants in the understory. Read LBA Woods: A Bird Refuge, by local birder Bob Wadsworth and download his list of LBA Woods’ bird species. For decades, the LBA Woods has provided our community with unique access to nature. Its gentle terrain offers an estimated four miles of walking paths, many wide and flat and therefore more accessible than those found in Watershed Park or Priest Point Park. The LBA Woods are a delight for young and old in all seasons and there are discoveries to be made around every twist and turn in the trails and footpaths. Many older visitors are happily reminded of the woods they played in when they were younger. Such connections to nature are important for our personal wellbeing and the health of our community. Olympians need natural places to relax, recreate, and socialize—especially as our city grows in population and our natural environment is replaced by a built environment. Recent medical studies show that larger forest tracts provide special health benefits to users, including immune system boost, lower blood pressure, reduced stress, accelerated recovery from surgery or illness, increased energy level, and improved sleep. Children who spend time in nature have higher ratings of perceived self-worth and decreased symptoms of depression, anxiety, ADHD, anger, and conduct disorders. The LBA Woods are close to many of Olympia’s elementary, middle, and high schools and would be ideal for field trips, environmental education, and nature studies. So what about human habitat? Where do we build new homes? 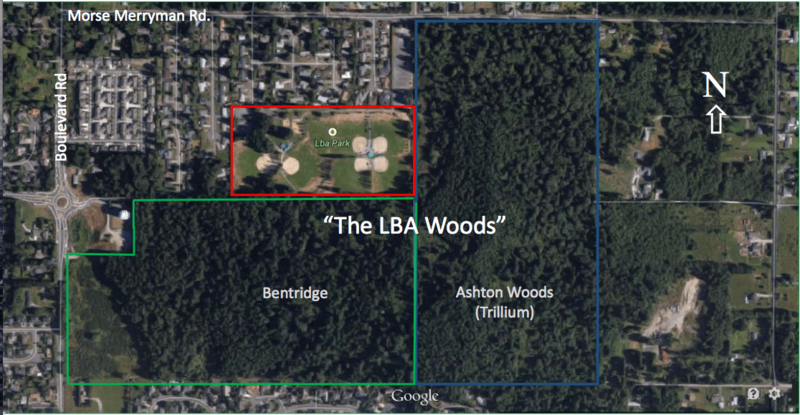 LBA Woods park advocates are frequently asked how saving this forest fits with Olympia’s Comprehensive Plan and our area’s goals for accommodating future growth without promoting urban sprawl. While cramming hundreds of houses replete with paved driveways and an average of two cars per household may have fulfilled the “numbers” goal often cited in population forecasts for the near future, this was not the most desirable or progressive use of Olympia’s last large undeveloped urban forest. Here is one thoughtful response to this important question.